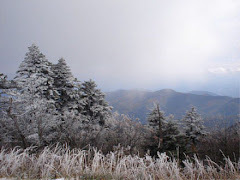 Nov 29, Cataloochee Ski Area, Maggie Valley NC. Cataloochee opened to 3/4 of the mountain to the top of the quad on four slopes in only two nights of snowmaking – a Cataloochee first! 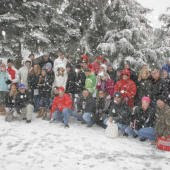 Nov 27 BLOWING ROCK Christmas in the Park, and Lighting of the Town Free. Hayrides through Blowing Rock - Memorial Park - 4:00-9:00pm. Caroling in the Park with the Vagabonds - 5:00-6:30pm. Visit with Santa in the Memorial Park Gazebo from 2:00-5:00pm. Hot chocolate, cider, bonfire and more! Enter today! The sweepstakes ends November 30, 2009. Great Selection of North Face Gear! 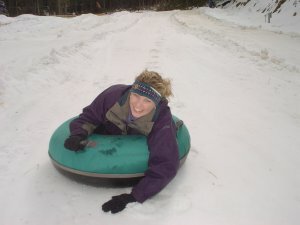 2009 - 2010 Season passes now available for Wolf Ridge at Scenic Wolf Resort. Season Passes are unlimited in skiing and snowboarding, anytime, day or night hours of operation, including weekends and holidays (DOES NOT INCLUDE RENTAL EQUIPMENT). Children 12 and under can enjoy a free sledding hill, located next to the Beech Mountain Chamber of Commerce and Town Hall. The hill is outfitted with its own snowmaking machines, keeping it alive with activity throughout the winter. The season is from November through Mid March , weather permitting. 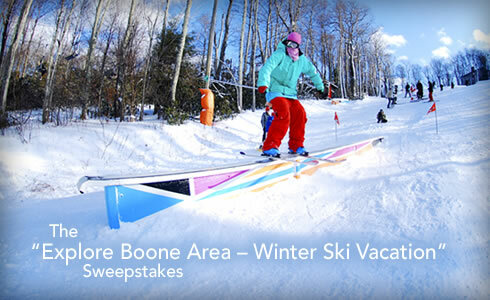 Call the Beech Mountain Chamber of Commerce for conditions 1-800-468-5506 or 828-387-9283. Parents must supervise their children. NEW this year - Intro to Skiing Lesson FREE with All Ski and Snowboard Rentals any non-holiday Monday through Thursday! 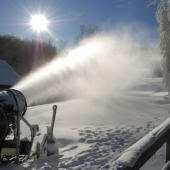 Cataloochee goes one step further to make sure your first on-snow experience is a great one! Cataloochee will be offering an introduction to skiing or snowboarding lesson FREE when you rent your equipment at Cataloochee! Lessons times will be offered at the top of the hour every hour from 9am until 7pm, Monday through Thursday throughout the season! Time/Place: Oct 16-25, Slopeside at Appalachian Ski Mtn, Blowing Rock NC. Appalachian's Tent Sale is the best time to update your ski and snowboard gear. This is a great opportunity to save on premier brands such as Arc’teryx, Atomic, Burton, 686, K2, Mountain Hardwear, Nordica, Obermeyer, Rip Curl, Rossignol, Roxy, Salomon, Spyder, Volcom, and many more. Take advantage of up to 70% on these brands on adult, children, and toddler clothing, helmets, ski and snowboard equipment and accessories. Save even more when you sell your old equipment at our Ski/ Snowboard Swap! Bring in any used skis, snowboards, boots, and poles between October 7 and October 14, weekdays only, between 8:30 a.m. and 4:00 p.m. For any used equipment sold during the Tent Sale, you will receive a credit in our Alpine Ski Shop. Don’t miss this great opportunity to upgrade your gear! September 3-7 at the Alpine Ski Center, 3440-B Tynecastle Highway, Banner Elk NC for 5 Days only! New 2010 equipment and clothing has arrived. Alpine Ski Center knows cool Fall weather is fast approaching and has the Latest 2010 fleeces, jackets and Winter apparel at the Lowest prices available the entire Season. Plus the NEW 2010 equipment for "gear heads" is here from Burton, Rossignol, Dalbello, Forum, K2, Ride, Salomon, & Atomic. Ski & binding packages start at $224 with snowboard & binding packages starting at $359. August 22-23 from 10AM - 5:30PM at Sugar Mountain Resort in Banner Elk take a scenic lift ride! Bring the whole family, a picnic lunch, your mountain bike, or just a friend and enjoy a breathtaking 45 minute roundtrip lift-ride to Sugar 5,300 foot peak. The majestic scenery is worth it! Groups of 20 or more can buy one-time ride tickets for only $5. Advanced reservations required. Please call 828-898-4521 x 261. July 2nd- July 6th Banner Elk , Alpine Ski Center. Summer Clearance Sale this 4th of July weekend in Banner Elk. We gathered inventory from all 7 Alpine stores is in Banner Elk for one BIG sale. Find a great deal on all skis and snowboards, jackets and pants, gloves and goggles, hiking shoes and much more, with easy lay-away on all the brands you love. Come see the great selection from The North Face, Burton, Spyder, Roxy, Quiksilver, Rossignol, Salomon, 686, Mountain Hardwear and so much more. Plus there is huge savings on all summer selection of swim wear, sandals, and sunglasses. Come celebrate the 4th at Beech Mountain. One of the High Country's premier Independence Day celebrations. After years of perfecting the seasonings and charcoal blends, our carolina pork barbeque and smoked turkey breast is arguably the best in the High Country. Enjoy music while dining outdoors (weather permitting, of course). And at dark, enjoy one of the best fireworks displays in the high country. Serving at 6 pm and fireworks at dark. Tickets can be purchased in advance at the Beech Mountain Chamber of Commerce, Fred's General Mercantile, or they may be purchased at the gate. Tickets are $15.00 per person and $7.00 for children 10 and under. Call (828) 387-9283 or (800) 468-5506 for additional details. Hike and bike at Sugar Mountain. These trails intertwine throughout the Village of Sugar Mountain and access is free of charge May through October during daylight hours. Trail maps are located in a black, marked mailbox at the base of the Flying Mile slope. Trails are constantly being maintained so please be cautious. While riding a bike within the Village limits helmets are required. Stecoah Valley Cultural Arts Center presents “Kids in the Kitchen” series. This class series will cover such topics as safety in the kitchen, reading and understanding labels,and preparing and cooking items from each food group. Alpine's JumpStart Summer Sale Going on NOW! Alpine's JumpStart Summer Sale Going on NOW! At Alpine Ski Center. Jump into your Summer the right way with a $10 OFF Giftcard , good off any purchase of $20 or more. Just go to www.alpineskicenter.com, to have your $10 off giftcard waiting for you at checkout of your local Alpine Ski Center. We have some amazing deals on Sunglasses form Native & Smith, great selection of Swimwear & Sandals, plus Waterskis, Wakeboards, & weekly in-store Disc Golf specials. FRED'S GENERAL STORE is having a 40% off throughout all 3 floors sale! 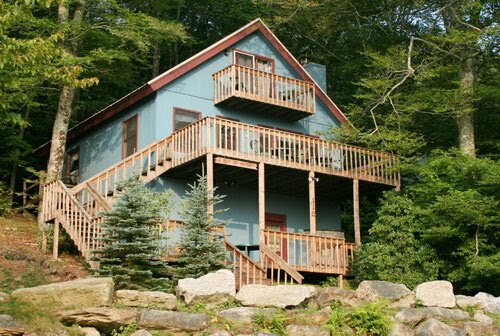 Serving Beech Mountain for over 30 years. May 15 to June 15 Banner Elk, Alpine Ski Center. Jump Start Summer SALE...Hurry in Now! At Alpine Ski Center, we LOVE our Winter....but we love Summer too! Jump into your Summer the right way with a $10 OFF Gift card, good off any purchase of $20 or more. Just click above or go to www.alpineskicenter.com to have your $10 off giftcard waiting for you at checkout of your local Alpine Ski Center. We have some amazing deals on Sunglasses, Swimwear, Sandals, Waterskis, Wakeboards, & Disc Golf. May 16 10AM - 5 PM Blowing Rock. A juried arts & craft show featuring 100 artists. and its only 6 more months until the start of the 2009/2010 season! have a great summer and get your season passes before the price goes up!!!! 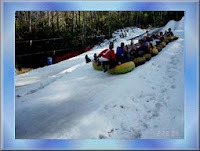 Wolf Ridge Ski Resort, formerly Wolf Laurel Ski Area, has undergone perhaps the largest growth and changes in North Carolina. The resort has expanded this year with 15 additional acres of ski terrain, a new Quad Lift and a new Terrain Park. The 15 additional acres takes Wolf Ridge Ski Resort to 82 total acres of terrain. May 23-24 Beech Mountain. An entire weekend of outdoor activity for the whole family. Beech Mountain will present the Beest Cycling Time Trial, in partnership with Charlotte Health and Fitness, on Saturday afternoon. The race will have a 2pm start followed by a 5:30pm Pasta Dinner (included with registeration, guests just $5 for adults, $3 for children) and a 7pm awards ceremony with over $100 in door prizes. Hosted by Buckeye Recreation Center. Sunday will feature group rides, including the legendary "Grizzly" metric Century for advanced cyclists. Sunday events will also include a 10am Group Hike and activities at the Buckeye Recreation Center. Registration for the Time Trial is $25 and is available online at www.CHFMag.com. Hawksnest builds the largest zipline course on the east coast. Hawksnest is in the process of building the largest zipline course on the east coast with 13 cables. These 13 cables add up to 2 miles of cable riding. The course takes you through the trees, over the trees, over creeks and surrounded by some of the best views in the High Country. Zipline riding is an exciting and safe experience for the entire family. By adding the zipline course to Hawksnest, they are able to offer year round family entertainment. The zipline course will be complete by June and will operate year round, weather permitting. Appalachian Ski Mountain will have it's longest ski season ever according to officials. The mountain will be open from Nov. 20, 2009 to April 11, 2010. Burton Snowboards, the world's leading snowboard manufacturer, selected Appalachian Ski Mtn. as the only ski resort in North Carolina to be named as an official Burton Learn To Ride Center. The Learn To Ride Center will give beginner snowboarders the best initial snowboarding experience, using proven instruction methods and equipment created specifically for beginners.